Preheat the oven to 200°C, gas mark 6. Wash and dry the chicken and season the cavity. Beat the butter and herbs together and carefully press under the skin on both sides of the breast. Smooth the skin flat. Rub the lemon halves all over the bird and then place them in the cavity. Blanch the onions and garlic in boiling salted water for 5 minutes. Drain and place in a roasting pan, and add the chicken. Cook for 40 minutes per kg, plus an extra 30 minutes. 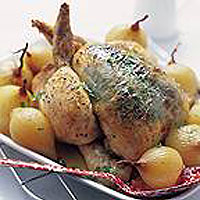 Check the chicken is cooked by inserting a skewer into the thickest part of the thigh. Cooking is complete when the juices run clear. Baste the bird and onions occasionally. Transfer the chicken and onions to a serving dish and rest in a warm place for 15 minutes, to allow the meat to become tender. Serve with the chicken, onions and garlic. Instead of herbs, try flavouring the butter with some spices such as ground coriander, cumin and a little cayenne pepper.